INSPEC owes its very existence to this topic! Its life began in 1981, when the founder and current Managing Director started designing laboratory test equipment to be used for PPE standards. Since those early days, INSPEC has grown from a 'one-man-band' into the internationally recognised and more diverse organisation. However, one core activity is still fundamental to our business - Test Equipment. When you search the menu on the left of this page, you will see the wide range of products that we make. Primarily they have been designed to support European standards, but in many cases can cover other standards too. All equipment has been carefully designed to satisfy the specific requirements of the relevant PPE standards and current safety legislation. 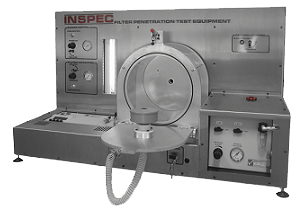 In June 2007, INSPEC was appointed the contract to provide the test equipment to be used for the UK Government, Department for Transport's, SHARP motor cycle helmet testing programme. See our TESTING section for more information. The test rigs have now been operating daily for six years, during which time they have tested more than 3,000 individual helmets and have performed over 14,000 impacts in total. Click here to go to the SHARP website, which gives detailed information about the programme and an animation of the tests. Not easily represented on the following pages is the topic of instrumentation. These days, so many test rigs involve computers - for control, measurement, display, reporting etc. We have specialists in-house who produce bespoke programmes for such applications. If you are considering updating your old equipment along these lines, be sure to get in touch with us. If you do not see what you are looking for, please do not hesitate to enquire. Even if the equipment is not known to us, our engineers are at your disposal and are always interested to consider new designs. Just let us know.